Coinbase is doing more than most to bring Bitcoin to mainstream audiences. The US startup — which recently raised $25 million — offers a consumer wallet and standalone merchant app, allows trading via SMS and more — now it’s released an SDK to enable support for Bitcoin payments in Android apps. The SDK — developed alongside micro-transaction startup Bitmonet, which we’ve written about before — is open source and available in GitHub. Beyond simply introducing payments, it allows debit and other previous unsupported transactions. 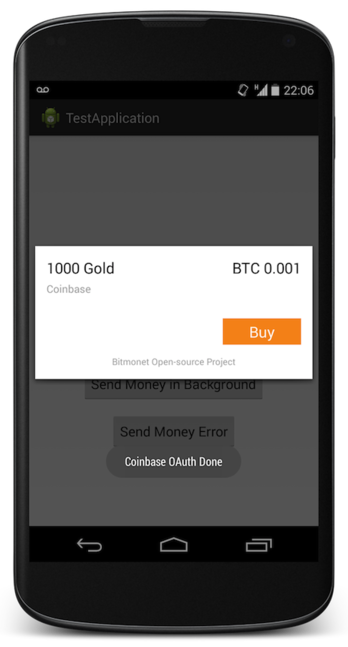 Bitmonet’s own payment gateway product is designed to encourage micro-payments — small transactions made without transaction fees — on blogs, and Coinbase believes the concept can work inside mobile apps via the SDK. Apple pulled Coinbase for iOS last year, so this project is Android-only.